A schematic new analysis of the human condition. 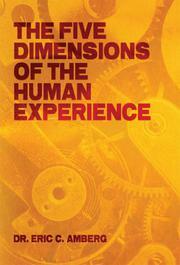 Basing his nonfiction debut on extensive experience in the mental health industry—dealing with, among other things, patients with PTSD—Amberg likens the totality of the human experience to an extremely complex piece of machinery, the parts of which need to be working in perfect alignment in order for the machine to function at its peak. Though “humans are clearly much more complex than the machinery we create,” human life can malfunction, and Amberg has isolated five “dimensions” whose efficiencies are essential to the success of the whole. The biological deals with physical health and well-being; the psychological encompasses all varieties of human interaction; the educational “inevitably gives definition to who we are”; the genetic concentrates on DNA, which contains “that which makes us special”; and the energetic connects humans to whatever they conceive of as God. (This is a spiritual rather than strictly religious book; all denominations, even atheists, might find it thought-provoking, since Amberg makes ample allowance for secular forms of inspiration.) The book takes an in-depth look at each dimension in turn, and given the author’s specific area of expertise, it’s not surprising that a group of seven case studies is the book’s most accomplished and rewarding section. These case studies involve people struggling with challenges such as substance abuse, learning disabilities and, of course, PSTD, and Amberg uses them to good effect as illustrations of the workings of the five dimensions he’s sketched out. These case studies also serve to highlight the element of personal accountability that runs through the whole book; for Amberg, “[t]he more responsibility we are willing to assume, the more access we have to our internal power and intelligence.” Accessing that internal power, he says, can lead to “self-actualization.” There’s a good deal of levelheaded, common-sense advice in these pages, all of it presented more in the clear prose of a diagnostic manual than in the fuzzy generalities of a self-help guide. An analytical, ultimately optimistic blueprint for taking charge of life and improving it.